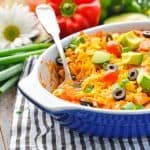 With hardly any prep work involved this Mexican Lasagna is the ultimate comfort food for busy weeknights! Preheat oven to 350F (180C). Spray a deep 11 x 7-inch dish, a shallow 9 x 13-inch dish, or any other similar-sized dish with cooking spray. In a large bowl, stir together chicken, onion, bell pepper, diced tomatoes, enchilada sauce, olives, and salt. Set aside. In a separate bowl, stir together 1 cup cheddar cheese, cottage cheese (or ricotta), and egg. Spoon one-third of the chicken mixture into the prepared baking dish. Spoon half of the cheese mixture over the chicken; top with a layer of corn tortillas (it’s fine if the tortillas overlap a little bit, and you can tear them to fit the shape of your dish). Repeat layers, ending with chicken mixture on top. Cover with foil. Bake, covered, for 30 minutes (or until hot and bubbly). Sprinkle with crushed tortilla chips and remaining ½ cup of cheddar cheese. Bake uncovered for 5-10 more minutes, or until cheese is melted. Allow to sit for 5-10 minutes. Garnish with sliced green onions, diced avocado, sliced olives, halved cherry tomatoes, and sour cream, if desired. Cooking Just for Two? Cut the ingredients in half and prepare the lasagna in an 8-inch square baking dish. You will only need 3-4 tortillas, so you can tear them to fit the shape of your dish, if necessary. Cooking instructions remain the same.